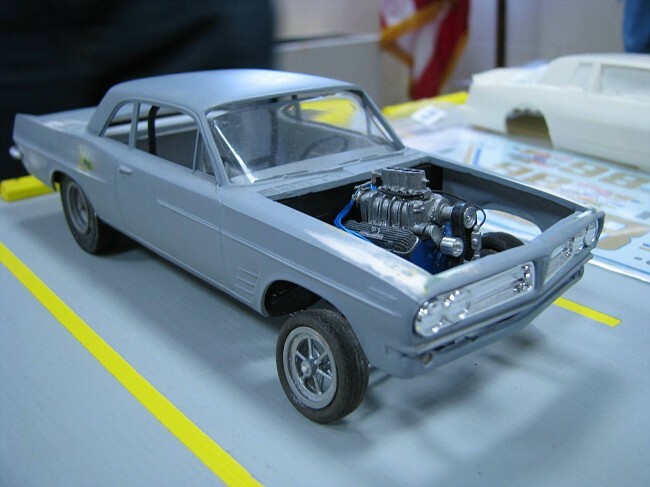 This is a model of an early 60’s drag car I’m working on. It’s a supercharged gas coupe, a drag racing class that was eliminated by the late 60’s. This car is my own design following the practices that were prevalent in the early years of drag racing. It’s in primer at the moment but will be orange when it’s finished. (Spray painting models is an art in itself.) The body is original plastic from the 60’s, originally available as a kit from AMT the same year the real car was made. When I bought the model it was covered in a couple of coats of thick enamel paint, which is maybe why it survived for fourty odd years! Sadly GM has eliminated the Pontiac Marque as of last year, the division had some of the best looking cars they made. The clean and attractive lines of the Tempest were hard to beat. They look good as a boulevard cruiser as well as a wild drag car. It wasn’t clear at first rather you were working on the model or on the car. Not to make you jealous but my younger stepson was given a fully restored 1968 GTO by his dad for his graduation present from Salisbury U. Somehow he’d managed to work on it for a year and yet still kept it a total surprise. You should have seen the expression on Micky’s face (I can send you the pic if you’re interested)!